Crock Pot Bacon Ranch Cheesy Chicken Hash is a deliciously easy weeknight dinner that’ll become a family favorite! It’s comfort food to the max! As much as I love to cook, I’m really lazy about dinner. I don’t know what it is. One night I’m inspired and want to make a totally amazing dinner, and other nights all I want is to go out to eat so I don’t have to think of what to make. 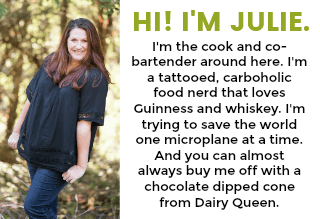 It probably seems weird since I’m a food blogger and all, but what can I say? Somedays I just get drained and making food for the family isn’t priority number one. Luckily my crock pot lets me be lazy and still feed everyone. Mike loves hash dishes. Whether it’s breakfast or dinner, that all-in-one meat and potatoes mash up is one of his fave things to eat. 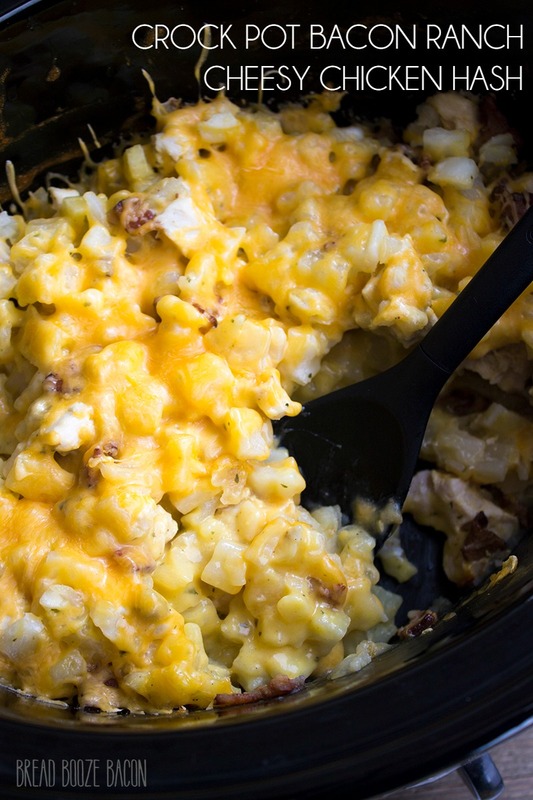 Bacon, chicken, and potatoes is one of our fave combos, so I whipped up this Crock Pot Bacon Ranch Cheesy Chicken Hash the other day and it was a big hit! But then again you can’t really go wrong when all these yummy ingredients are combined. The best part is that only prep is cooking bacon (which will make your house smell awesome!) and cutting up the chicken. Then just throw it all in the slow cooker, cover, and count the down minutes to deliciousness! 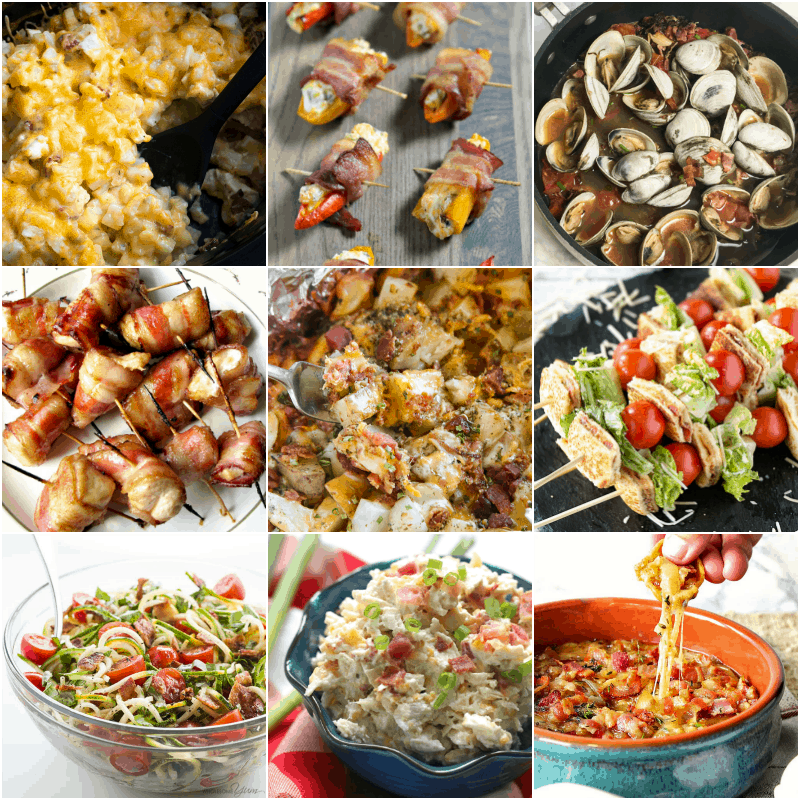 Every Wednesday this month, we’ll be sharing bacon-centric recipes to make you drool. 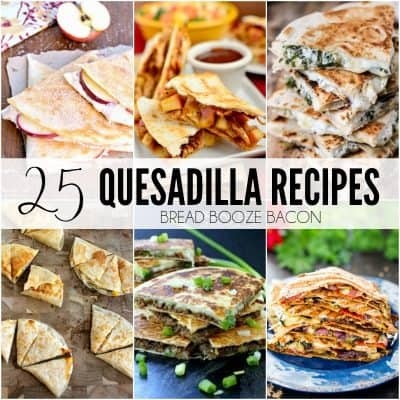 And if that’s not enough to make your tummy grumble, you can grab bacon recipes from the previous bacon months too! 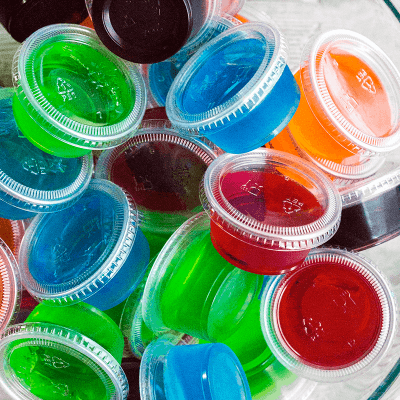 Ready to see what deliciousness is waiting for you today? Crock Pot Bacon Ranch Cheesy Chicken Hash is a deliciously easy weeknight dinner that'll become a family favorite! It's comfort food to the max! In a medium bowl, whisk together the soup and milk until combined. Then whisk in the ranch dressing mix. Set aside. To a 5-quart slow cooker, add the frozen potatoes, ranch/soup mixture, chicken, and bacon. Stir to combine. Cover and cook on HIGH for 4 hours, or until the chicken is fully cooked and the potatoes are tender. 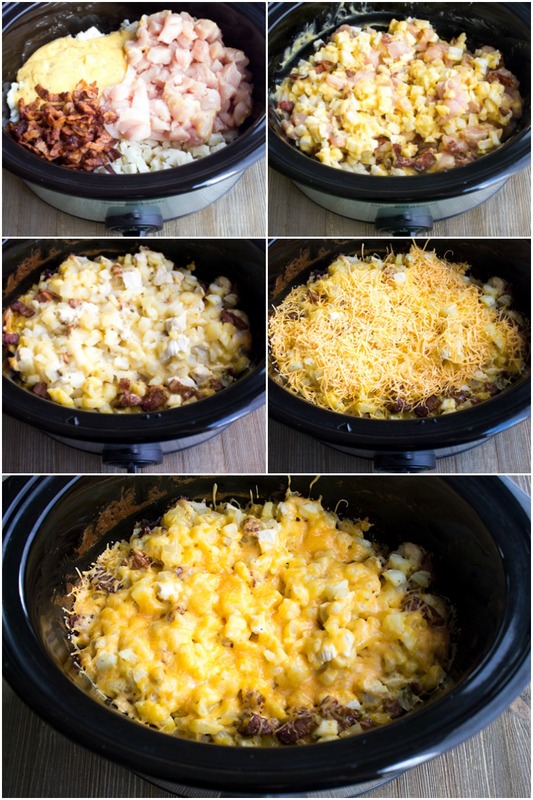 Take the cover off the slow cooker, sprinkle the top with cheddar cheese. Re-cover and cook for another 5-10 minutes, or until the cheese is melted. Serve warm. This recipe is made with raw chicken, not frozen. First off – thanks for hosting this bacon-tastic group!! Secondly, I neeeeeed this dish in my life! It looks *so* fab, Julie! I can’t wait to try this out with the family. They are going to love it! Well- great minds you know. Go figure that we shared very similar recipes on the same day – how did that happen??? LOVE the addition of chicken! Looks AMAZING as always. I’m kind of the same way about cooking dinner lately. I used to love it, and now it’s just another chore most nights. What I like, like you, is having it prepared early and then not fussing over anything when it comes time to eat. 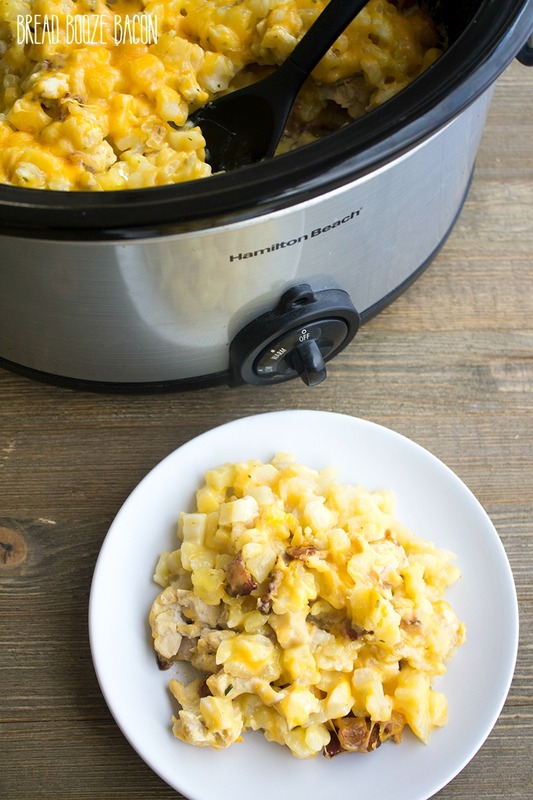 This crock pot bacon cheesy chicken hash looks like just the ticket!